← Traffic Justice: Will NYPD enforce the Law? Can Vision Zero succeed without good information? In November , CHEKPEDS testified at a hearing of the City council Technology committee that NYPD was allocating vastly more resources to car crashes without no physical injuries than to crashes with pedestrians/bicyclists injured or killed. CHEKPEDS has always been very focused on using good data to inform our elected and bring about change. In 2005 we foiled the Departement of Vehicles to find out how many people had been killed or injured on 9th Avenue. Thanks to our Borough President Gale Brewer, there is now a requirement for all agencies to publish their data on an open platform to be used by the public and developers alike. What we found in the published data (2012- 2014) for CB4 was astounding: 25 % of collisions were due to Failure to Yield and 45% is due to distraction. Nothing new here but we also found that in 51% of the injuries the NYPD did not report a contributing factor. More concerning, we found that in Manhattan, NYPD spent 11% more resources documenting contributing factors for crashes with motorists’ injuries than crashes with pedestrians’ injuries. 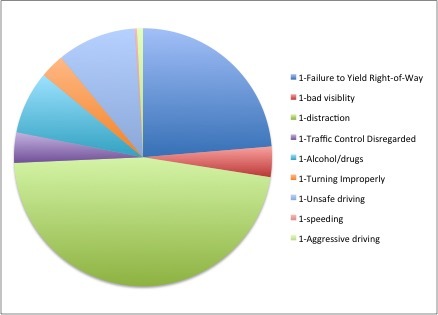 Further 4,044 man/days were dedicated to document contributing factors for crashes with no injuries, but NYPD could not dedicate 2 officers to document contributing factors for pedestrian injuries. This is excellent information showing how the allocation of resources is skewed towards insurance companies and automobiles, not towards pedestrians cyclists and human life. It also shows that NYPD must collect much better information to support the Mayor’s Vision Zero. This entry was posted in CHEKPEDS, Traffic Justice and tagged Information, NYPD, safety. Bookmark the permalink.